Republican presidential nominee Donald J. Trump makes a point during his speech at a rally Thursday at the Roberts Centre. WILMINGTON — A day after delivering a speech on immigration security, Donald Trump continued to stress his America-first approach at a Thursday rally in the Roberts Centre near Wilmington. But then the Republican presidential nominee added, “our greatest compassion will be for the American citizen,” a statement that drew loud applause from the thousands attending. Trump in a Wednesday night speech in Arizona said he would immediately force out immigrants living in the country illegally who’ve committed crimes, as well as expel people who’ve overstayed visas. In Clinton County Thursday, Trump started his 23-minute talk by speaking about economic policy. He said some practices are going to stop, citing product dumping, unfair foreign subsidies and currency manipulation. “The era of economic surrender, which is what we’ve done essentially, is over. A new era of American greatness is going to begin,” said Trump. His Democratic opponent, Hillary Clinton, backed the North American Free Trade Agreement (NAFTA), China’s entry into the World Trade Organization (WTO), and a “job-killing trade deal” with South Korea, Trump said. Ohio has lost nearly one in three manufacturing jobs since NAFTA was enacted in the 1990s, he said. The GOP nominee promised “a massive tax cut for working Americans,” and to repeal and replace the Patient Protection and Affordable Care Act (often called ObamaCare) — the latter pledge receiving a lot of cheering. On education, Trump spoke in favor of school choice and against Common Core. He said he and the president of Mexico, with whom he met Wednesday, have a shared desire to secure the border between the two countries, “put the [drug] cartel out of business,” and keep jobs in the Western Hemisphere. On foreign policy, Trump said he supports rebuilding what he called a depleted military, and called for avoiding “needless foreign wars” and for building new friendships overseas. With a Trump administration, there would be a new immigration screen test for entry into the United States, he said. “We only want to admit those into our country who share our values and love our people,” said Trump. Former New York City Mayor Rudy Giuliani introduced Trump at Roberts Centre. Local pastor Dan Mayo gave the invocation, local military veteran Josh Sams led the pledge of allegiance, and local resident Becky Riley sang the national anthem. Speaking prior to Trump were Ohio Senate President Keith Faber and Clinton County Republican Party Chairman Tim Inwood. The local GOP chairperson also spoke about “illegal aliens,” expressly saying he would not use the term “immigration,” explaining that immigration is a legal process and the people at issue had not gone through that process. Most attending the Trump visit liked what the candidate had to say and were excited by the entire experience of the rally. “It was an exhilarating experience and very cool to see Mr. Trump in person and so close,” said Tyler Wells, a Wilmington High School senior who attended the rally with his father, Bill. “His speech was very gripping. He really reached out to the young people here and about protecting our future,” Tyler Wells added. Tyler, 17, will turn 18 on Nov. 6 and will be registered to vote in his first election. Of course, not everyone in Republican-concentrated Clinton County was pumped up by Trump’s local stop. “Clinton County families know what it’s like to go through tough economic times and we know what it’s like to bounce back,” said Ann Reno, executive chair of the Clinton County Democratic Party, in a statement to the News Journal prior to Trump’s speech. Trump is also vowing to invest more money in the military to make sure soldiers have the best equipment and medical care. Reach Gary Huffenberger at 937-556-5768 or on Twitter @GHuffenberger. The Associated Press contributed to this story. 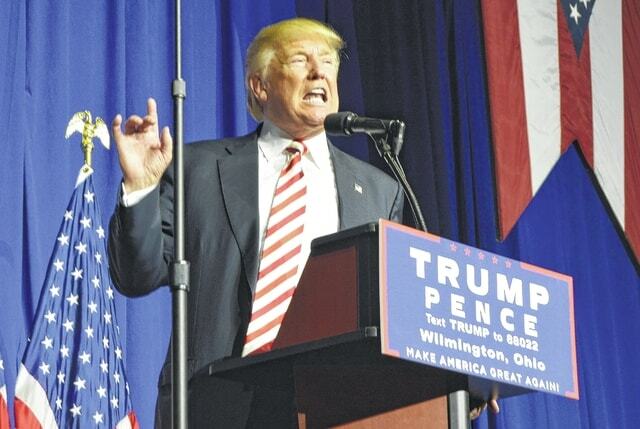 https://www.recordherald.com/wp-content/uploads/sites/27/2016/09/web1_Trump-Main.jpgRepublican presidential nominee Donald J. Trump makes a point during his speech at a rally Thursday at the Roberts Centre.